What are you watching on TV tonight?! 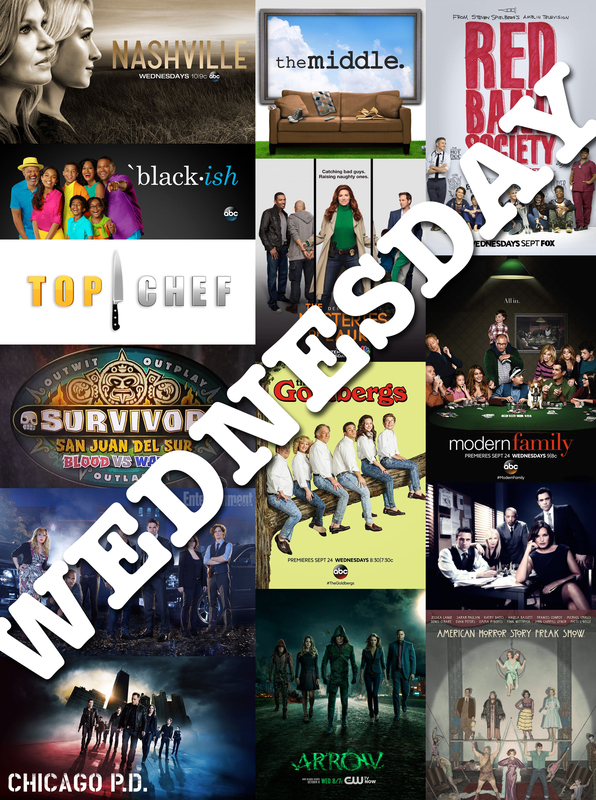 Be sure to take a look to see what’s showing on Wednesday Nights starting this FALL! New this season: Nine pairs of new players, each with a pre-existing relationship, divided onto two tribes of nine. This is the Second Season to feature loved ones playing together. Reason to tune in: The hilarity of 80s fashion and pop icons. Plot: The show tells the story of a group of children and teenagers who meet as patients in the children’s wing of a hospital. What if a hospital was your high school, boarding school and summer camp rolled into one? What if it was the place where you fell in love for the first time and made friendships that lasted a lifetime? And what if it was all weirdly hilarious and the most fun you ever had in your entire life? This is the world of RED BAND SOCIETY. Reasons to tune in: To see if they really deserve the Emmys that they keep winning…. Reason to tune in: The entire main cast will return for the tenth season except Jeanne Tripplehorn (Alex Blake), who left the show in the ninth season finale. On July 1, 2014, it was announced that Jennifer Love Hewitt will join the show as a series regular and will play Kate Callahan, a former undercover FBI agent whose exceptional work lands her a job with the Behavioral Analysis Unit. Plot: Black-ish is an American comedy series starring Anthony Anderson and Tracee Ellis Ross, the single-camera comedy centers on an upper-middle-class African-American family. Plot: The series follows the life of Laura Diamond, a homicide detective with the New York Police Department who balances her day job with her off-duty hours as a single mother to twin sons, while trying to get her soon-to-be-ex husband to sign the divorce papers. Plot: The show focuses on a uniformed police patrol and the Intelligence Unit that pursues the perpetrators of the city’s major street offenses. A spin-off of Chicago Fire. Reason to tune in: Rayna has two proposals on the table at the end of last season… who will she choose?!?! Plot: The fourth season will be set in Jupiter, Florida in 1952. It will be centered around one of the few remaining freak shows at the time, as its members do anything to keep the business alive. The season will focus on the conflict between the freaks and the “evil forces” who do not understand them. The season will also feature a “clown killer” and a “bearded lady”. New this season: Top Chef goes to Boston and Richard Blais joins as a new judge. Plot: Stalker is an upcoming American drama television series about detectives who investigate stalking incidents – including voyeurism, cyber harassment and romantic fixation – for the Threat Assessment Unit of the LAPD. What are you watching tonight?!! ?